Spyderco C156GPBBK C156GBBK Southard G-10 Plain Edge Folding Knife FREE SHIPPING! Designed by Brad Southard, known for making high performance folding knives, the Spyderco C156GBBK Southard G-10 Folding Knife features a Carson flipper opening lever. To open the knife, you use your index finger to press the lever while flipping the knife out quickly with authority! With the captive ball-bearing pivot system, you get a knife that opens up smoothly with a solid lock due to the Reeve Integral Lock (R.I.L) mechanism. 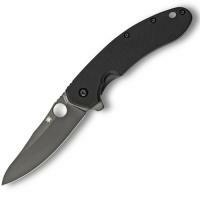 Spyderco Southard features a hollow-grade blade that is made of CTS 204P steel. Offering excellent cutting performance, this plain edge knife is coated with durable titanium carbonitride coating. The handle of the Southard is made of G-10 scale that is medium textured, giving you excellent ergonomics and grip on the knife. To make this knife solid, thick titanium liner and titanium scales make up the internals to give this Spyderco a solid sturdy lock up when opened. An additional feature of the locking mechanism is a small inlaid G-10 panel that acts as an overtravel stop when releasing the lock. The Spyderco C156GBBK Southard G-10 Plain Edge can be clipped to your pocket with its stainless steel clip for right-side tip-up carry. ©2002-2019 CopsPlus.com: Spyderco C156GPBBK C156GBBK Southard G-10 Plain Edge Folding Knife FREE SHIPPING!